Double bowl 20 gauge stainless steel topmount sink, with Spillway<sup></sup> partition between bowls to prevent water on the counter, rear drains to allow for more storage below the sink, and easy care satin finished bowls. Includes waste fittings, and is backed with a Limited Lifetime Warranty. A great compact sink with large bowls. Double bowl hand fabricated 20 gauge apron front sink with curved apron. Sink may be installed above, below, or flush with counter. Bowls are sloped to center of the waste holes, and drain lines for efficient draining. Rear drain positions for more storage below the counter. Commercial satin finish is a lovely complement to commercial look appliances, and is easy to maintain. Oversized double bowl 20 gauge stainless steel topmount sink, with faucet ledge, 1 hole faucet drilling, Spillway<sup></sup> partition between bowls to prevent water on the counter, rear drains to allow for more storage below, and easy care satin finished bowls. Includes waste fittings, and is backed with a Limited Lifetime Warranty. 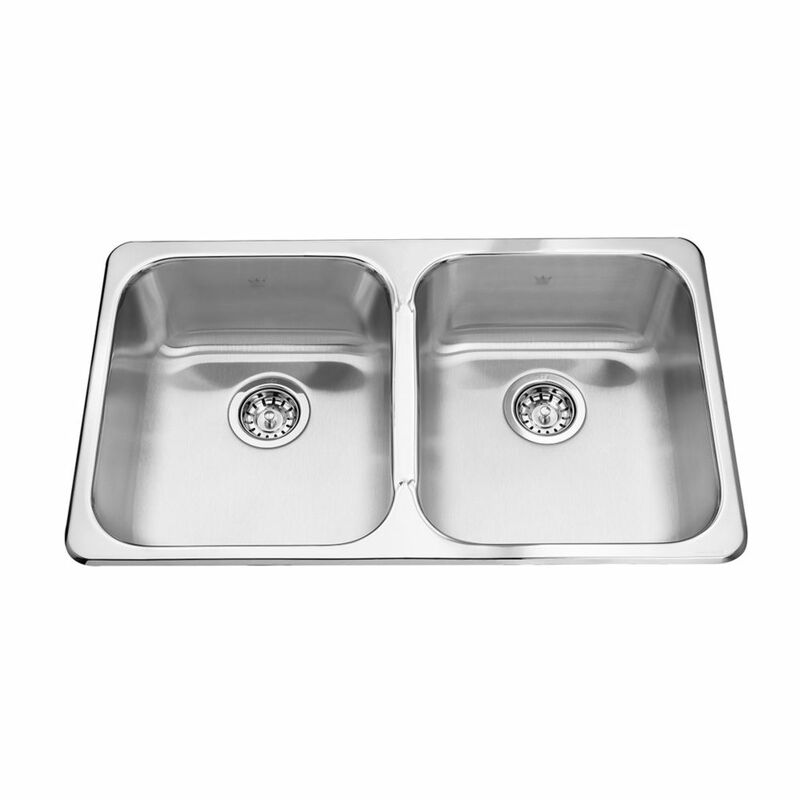 Double 20 Ga Double bowl 20 gauge stainless steel topmount sink, with Spillway<sup></sup> partition between bowls to prevent water on the counter, rear drains to allow for more storage below the sink, and easy care satin finished bowls. Includes waste fittings, and is backed with a Limited Lifetime Warranty. A great compact sink with large bowls.